The Smolensk aircraft plant has a long and glorious history. It is one of the oldest Russian aviation enterprises. The idea to organize it in Smolensk belonged to the future Soviet Union Marshal M.N. Tukhachevsky, known for its innovative offers in the field of military affairs. Its building began in 1925, and in November, 8 of the following year, the grand opening of the company, which was called the Smolensk aircraft repair plant number 3, took place. In the late thirties, the plant began to fabricate the war goods – it was the preparations for the large-scale producing of a new for the time IL-2, the famous Soviet attack aircrafts, but the initiated broke up any plans. Front was quickly approaching to the Smolensk, the plant was immediately evacuated to Kuibyshev, where the plant № 122 has been built. The Smolensk citizens amounted about 90% of qualified labor force of the new enterprise. But the difficult situation of the first war months led to the fact that more than 500 factory workers were forced to go to the front. Someone worked in the aircraft repair field team, while the others fought with deadly force in arms, including performing dangerous missions behind enemy lines. Many of them died a heroic death. In the postwar years in the Soviet Union began a massive operation aimed to finding the remains and to memorize soldiers who died in the battles for the freedom and independence of our Motherland. As a result, the number of the Smolensk aircraft plant employees who died in 1941-1945, there were found the remains of more than 100 people, whose names were set. In 1975, the direction of the Smolensk Car Factory decided to build a memorial, opposite the factory checkpoint, in honor to the factory workers, who died in the battles against the Nazi invaders. It was made an in-plant competition to find the best memorial project design, and it was won by the artist-designer P.V. Tumanin. The memorial was unveiled in 1979, it was built by the staff of the plant during outside hours — on weekends and clean-up events. The monument was set in the Frunze Street, opposite the factory entrance. To the ground, where the memorial was located, was brought some soil, taken from the places where the factory workers had fought and died. On the concrete pedestal, faced with red granite tiles, there is a five-meter stele in the south side, with reinforced metal plaques with the names of those 118 employees of the plant, who died in the WWII. On the north side there is the other stele, with letters, denoting the war period «1941-1945″. The steles symbolize the air-plane wings; there are two ten-meter titanium bayonets in the aperture between them. Bayonets are connected with a metallic laurel wreath, with a five-pointed star put in it. Factory workers do not forget those, who gave their lives in the struggle against the Nazi oppressors. Still there is a hard working process of searching the remains of the Smolensk aircraft factory workers, killed in fight with the hated enemy. This work has its own results: the new names appear. Nobody is forgotten — and nothing is lost. 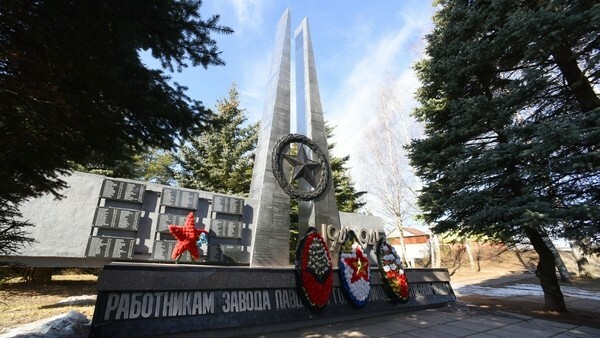 The memorial sign in honor to the aircraft factory workers, who died during the Great Patriotic War, is the object of cultural heritage (the monuments of history and culture) of the regional importance.